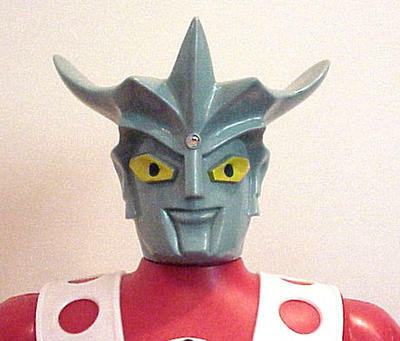 Ultraman Leo (ウルトラマン レオ) was the seventh show in the Ultraman series of programs from Tsuburaya Productions and by all accounts was the most grim and therefore unpopular of the bunch. Still, it managed to run for a total of 51 episodes from April 12, 1974 to March 28, 1975 and many toys from the program were produced, including the very rare Jumbo Machinder from Popy. 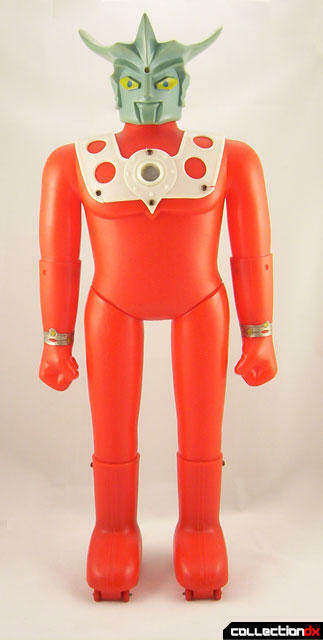 It was the second Ultraman jumbo to be released, following Ultraman Taro which was released the previous year in 1973. Both Ultraman jumbos are very hard to get, but there is no question that the Ultraman Leo is the rarer of the two, with fewer than 10 known examples that can be accounted for today. In fact, it is generally accepted as being the rarest Popy hero Machinder, with only a couple of the villains being harder to find. Many people don't seem to actually like this jumbo as it is admittedly rather boring looking. Besides the nice sculpt on the head, everything else about it is very plain. The entire body is cast in red polyethylene with a separately molded white poly crest screwed into the upper chest. A blue emerald (missing from this specimen) is embedded into the crest and the wrists feature silver and yellow stickers. Also missing from this specimen is a sticker that simply says "Ultraman Leo" that is normally on the stomach. Like all the early Machinders, Leo has wheels on his feet and and you can remove the lower arms to add separately sold accessory fists. Of course, it makes absolutely no sense to be able to remove the arms from a human-style character, but I'm sure Popy was thinking more about the dollars generated from the extra sales than anything else. This toy is actually slightly, but noticeably, smaller than other jumbos, measuring in at slightly more than 57cm (or 22.5") as opposed to the standard 60cm. Normally, I really don't have much interest in variations and do not consider my collection to be incomplete if I don't have all the different versions. But I think in this case the contrast is so striking that someday, I'd really like to have both. I'd also like to note that I think it's just the different lighting, camera, etc.. that causes the difference in color in those two photos, not another variation. The second thing that makes Ultraman Leo stand out from the pack is how difficult it is to get in a box. And when I say difficult, I really should just say impossible. For whatever reason, this toy's box is almost never seen. In fact, it's only been seen once. Last year there was a specimen of it located at the Bandai Musuem in Japan (see image below). On my recent trip there in February 2006, for whatever reason, it was no longer there, or at least no longer on display. If anyone visits the museum and sees it, or can find out what happened to it, I'd love to know about it. I must say that I really like this toy, in no small part because I tend to become enchanted by rarity. Though there are certainly many Machinders that are nicer toys, this was one that I always longed to get simply because I knew it would be so hard to do so and I thought that having it in my jumbo lineup would give the overall presentation a unique look. I've spent way more time gazing at pictures of jumbos than I'd care to admit and I've found that the less I see of something, the more I want it. If you're looking to add this toy to your own collection, it will certainly require patience. Thanks to Tom Franck for the additional images of the thin head version and box! I just want to say I'm happy & grateful for your excellent job in these Jumbo Machinders reviews that are so helpful to us the fandom. Please keep up the good work & those awesome reviews!! Now its more easy for me to know what to look in the auctions. Thanks! But I'm probably enjoying writing them even more than you are reading them. I just hope I'm doing the toys justice. They are definitely more difficult to photograph than smaller toys. Great Jumbo reviews, keep them coming please. BTW, I was at the Bandai Museum last November and the Leo box was still there at that point. 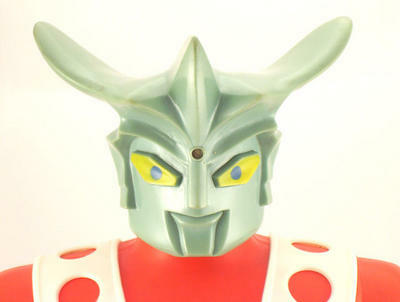 It was in a display case, lying on it's back, behind some vintage Ultraman toys. Is that how you last saw it? (I took a few pics of it, but it was difficult to get a decent shot due to how it was poorly displayed). If it's gone now, that would be a shame due to it's rarity. That museum is the only place that most collectors would ever see something like that (and the Garada jumbo) so it would be a shame if Bandai didn't appreciate the importance of having the item on display.